I'm so happy to offer this class: my Relic Ring! This is a class that I've taught many times in person. My students love it, not just because it's beautiful but it's also lots of fun to make. My inspiration for this piece came from a visit to the Museum of Fine Arts, in Houston. There was an exhibit of jewelry from the ancient city of Pompeii. It impressed me so much that these amazing relics had been unearthed from beneath layers of ash and destruction, and still survived. Using the inspiration from the Pompeii pieces, I set to work. I wanted my "relic" to have the look of something that might have been excavated from an archaeological dig. I had a great time accomplishing that...and now you will, too. One of the best things about this project is that you won't need a lot of fancy tools. It can actually be done using simple hand tools but I'm going to show you a few different ways to accomplish things like polishing...including a great shortcut using your tumbler, if you have one. If you have a JoolTool, I'll show you a great, quick way to finish your ring. If not, I have an alternative that's super easy! I'll show you which stones work best for this project and how to find gorgeous stones without spending a ton of money. There's a minimal amount of soldering in this one, which makes it a great class for beginners. But, more advanced students will enjoy it, too! We'll be using a butane torch because it's an accessible and inexpensive way to learn metalsmithing. But, there are some tricks to it and I'll help you learn how to get the most from your butane torch. We'll also be doing some really fun texturing. I'll show you a few different ways to do this, including how to make your piece look like an ancient relic! 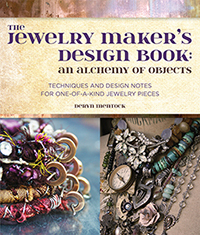 As a pioneer in the field of online jewelry making classes, I strive to make sure my workshops are of the highest quality and my online classes are an exceptional value. They include highly detailed, excellent quality videos that you'll be able to watch as many times as you like; no driving, no airfare, no hotels and no schlepping your heavy stuff! You’ll have continual access to my classroom for the duration of the class. Like to work in your jammies?...the videos will be at hand…a click away…any time of day or night, for you to view as many times as you want. I love making jewelry and sharing my skills. I give you quality online course content enabling you to learn from the privacy of your own home. You'll feel like you're right there in my studio, with me! Your payment is your registration. You should receive your log on information, via email, within 3 days (please see below). A complete tool list will be made available, along with a resources list and other pdf files. I'll be available to teach, guide, critique and answer your questions for the duration of class. I've wanted to offer this class for a long time and have had many requests for it. I'm so excited to offer it now! Please Read: Important... I accept Paypal payments only. Please make sure that your Paypal email address is the one you would like the classroom password sent to. Also, please make sure your full name is included in your paypal payment information. When you register, if you do not hear from me, please check your spam/junk folder. If you don't see my email with the log on information, contact me via email: mocknet@sbcglobal.net, my website, or facebook. If you have not received the log on information within 3 days, and it's not in your spam email folder, please contact me. Registration will remain open through the early March, 2019. The workshop will run for two full months on my private classroom site. All videos will be posted on the first day of class. Videos are not downloadable but, once the videos are posted, students will be able to view them any time, and as many times as desired. This means you can work in your jammies, at three in the morning, if you choose! I will be available the entire duration of the class for questions and troubleshooting. For a metalsmithing class, this one uses comparatively few tools. Please understand that it is difficult for me to determine the cost of the tools you'll need but you will need some basic metalsmith tools: files, pliers, hammers, bench block, butane torch, etc...some of which you may already have. Other tools like a flex-shaft and tumbler are optional for this class. PDF's of the complete tools/supplies/resources lists will be provided after registration.